In the lead up to the World Barista Championships, University of Bath scientists say brewing more flavoursome coffee could be as simple as chilling the beans before grinding. 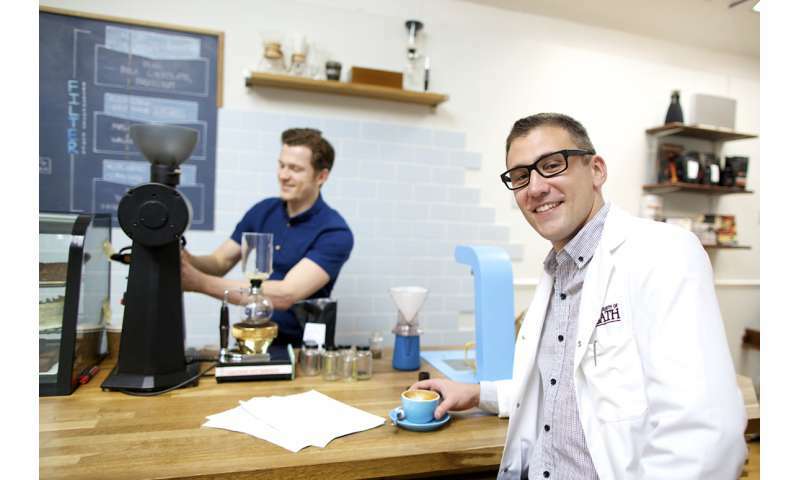 A team from the University working with renowned Bath coffee shop Colonna & Smalls found that chilling roasted beans before grinding resulted in narrower distribution of small particles, which during the brewing process allows access to more flavour from the same amount of coffee. Coffee is among the most valuable traded commodities globally, worth $17.9T USD to the US economy in 2015 alone. This discovery could have big implications for the coffee industry and might even allow domestic coffee connoisseurs to brew tastier beverages. The team studied the effect of grinding beans at different temperatures, from room temperature to -196°C, and discovered that the colder the beans the finer and more uniform the particles were from the grind. That's important, because small uniform coffee grinds allow for better extraction of the flavour compounds - allowing you to brew more coffee and get more flavour. Dr Christopher Hendon, a chemistry PhD student at the University of Bath at the time of the study, now working at the Massachusetts Institute of Technology, said: "What you're looking for is a grind that has the smallest difference between the smallest and largest particle. If you have small grinds you can push flavour extraction upwards. We found that chilling the beans tightens up this process and can give higher extractions with less variance in the flavour - so you would have to brew it for less time, or could get more coffee from the same beans. "It will alter the taste, because subtle changes in particle size distributions make a huge difference in rate of extraction. I wouldn't be surprised if people struggled to achieve balanced extractions. "It could have a major impact for the industry. People are trying to produce a very high quality drink with really quite powerful tools and are willing to try new things." The study, highlighted in Nature, is published in Scientific Reports. Maxwell Colonna-Dashwood, co-owner of Colonna & Smalls, said: "Grinding coffee may seem quite straightforward - break coffee up into a lot of tiny bits so you can dissolve it in water. But like the whole world of coffee the subtleties of the process have a huge impact on the flavour and quality of the cup of coffee. The ability to understand grinding more comprehensively has the dual impact of allowing us to make better tasting coffee and to be more efficient in the way we do that. "The research suggests that temperature of bean needs to be more constant to help us achieve consistent grinds. It suggests that cooler temperatures will allow us to maximise surface area and utilise more of the coffee. All of this will impact on how we prepare coffee in the industry, I bet we will see the impact of this paper in coffee competitions around the globe, but also in the research and development of new grinding technology for the market place." The World Barista Championships take place in Dublin between 22-25 June. Coffee is among the most valuable traded commodities globally, worth $17.9T USD to the US economy in 2015 alone. $17.9T is the size of the entire US economy in 2015. I know productivity would drop without caffeine, but not to zero! Does that mean put it back in the freezer after grinding cold? Tried this in the morning. Hardly any of the fine powdery grounds which was a definite plus. The taste wasn't as bitter also. i thought it was fairly common knowledge to cool the beans before grinding, but not after? I have put tomorrow's beans in the freezer. I prepare my double espresso with freshly grounded coffee every morning. I'll be back to give my appreciation then. Preparing my coffee is quite a ceremony and I am fussy about it, but I will spare you the ceremony and go straight to the relevant details. I tossed the portion of frozen beans in my burr grinder; the resulting grind came out finer without feeling dusty. The grind came out at room temperature; usually it is a little warmer. Filling the port-a-filter with it, I did not have to apply much pressure on the tamper to have a smooth and non porous looking surface. Pouring the hot beverage, it came out as usual; with a nice uniform crema. The coffee was smooth and tasty as usual. The only difference that I felt was maybe at the end of the cup, where the residues end-up; I had to tip my cup and let the last drop come down before tasting any slight bitterness. For this it might be a plus, but I am not sure; I will do my usual preparation tomorrow to verify this. Hey, I'm chill. My beans R chill, too. >worth $17.9T USD to the US economy in 2015 alone.